A UN sponsored report has stated that Afghanistan government officials in charge of oversight of local police covered up complaints of corruption against law enforcement and has urged their dismissal, according to a copy of the paper seen by Reuters. The United Nations Development Program (UNDP) is reportedly investigating why its own division, the Law and Order Trust Fund of Afghanistan (LOTFA), which commissioned the report, failed to show it to senior UN officials after it was submitted in January. UNDP did not say why the submission was delayed. Since 2002 LOTFA, established in 2002, to "enable the international community to mobilize resources to strengthen the country’s law enforcement," has received around $3.6 billion from international donors to pay Afghan police force salaries and other expenses. It pays the salaries of about 145,000 Afghan National Police (ANP) personnel and over 5,500 uniformed personnel of the Central Prisons Department (CPD). The Electronic Payroll System (EPS) covers 95 percent of the police force, and 91 percent of CPD guards, while the so-called Electronic Fund Transfer (EFT) covers 80 percent of salaries for ANP and 94 percent of CPD officers, according to the UNDP website. LOTFA commissioned the troubling report to find out why the main system for filing complaints about police misconduct, a 24-hour phone line, rarely led to prosecutions in Afghanistan. It found that only nine out of over 2,000 complaints referred to the inspector general’s office in the country's interior ministry over a year were actually forwarded for prosecution, according to the document cited by Reuters. It means the chief of the agency, Hakim Nejrabi, along with his senior personnel, ignored an avalanche of complaints or else simply blocked them. "Systemic corruption is endemic to the organization because the leadership has not only tolerated corruption, they have facilitated it and, in many instances, participated in it," the report concluded, recommending the sacking of Nejrabi. The senior Afghani official has dismissed the allegations made against him in the report, dubbing them "a political character assassination." He claimed that over 50 interior ministry officials had been investigated since he took office over a year ago, and a total of 22 cases had been forwarded for prosecution. The UNDP said it only learned of the report after Reuters asked about it in April and is currently busy reviewing its internal processes "to improve efficiency, oversight and accountability to prevent this from happening again." 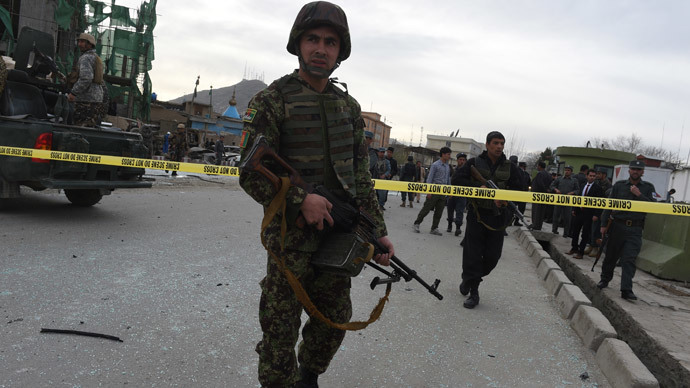 It also added that a copy was then forwarded to Afghanistan’s anti-corruption watchdog, the Independent Joint Monitoring and Evaluation Committee (MEC). Last year, the US special inspector general for Afghanistan reconstruction slammed LOTFA for allegedly losing track of millions of dollars in payments to some ghost employees. Yama Torabi told Reuters the report "shows that for years they've done nothing to solve the problem - not LOTFA, the Afghan government, or previous ministers." Meanwhile, a report in January by the Special Inspector General for Afghanistan Reconstruction (SIGAR) found that the two main electronic systems used for payroll data in Afghanistan are awash with flaws and cannot even communicate with each other. "The ANP’s process for collecting attendance data, which forms the basis of all ANP personnel and payroll data, has weak controls and limited oversight," the report released on January 30 stated. It noted that neither CSTC-A (The Combined Security Transition Command) nor UNDP officials are present to oversee the data collection, and reported "limited knowledge of and influence over the process." On top of this, SIGAR said that a daily sign-in, sign-out system for recording attendance was reportedly only used by officers and not enlisted personnel, so there is no documentation that unit commanders are "accurately reporting subordinate personnel attendance." "All these factors could result in personnel being paid for days not worked, either with or without knowledge of supervisory personnel," the report concluded. "Unless the Afghan Interior Ministry (MOI) develops the capability to ensure and verify the accuracy of ANP personnel and payroll data, there is a significant risk that a large portion of the more than $300 million in annual US government funding for ANP salaries will be wasted or abused," SIGAR warned.